Traders have accused managers of bullying as one of London's most famous markets closes for redevelopment. Temporary buildings at Stables Market in Camden, north London, will be replaced by two four-storey retail and office buildings from next week. 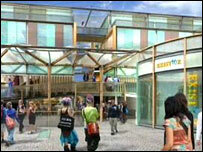 Traders said manager Stables Market (Camden) Ltd put pressure on them to sign a petition in favour of the plan. It denied the accusation and said: "We are making every effort to relocate stalls elsewhere in the market." The plan to demolish part of the market's entrance arch and build permanent retail, food, office, storage and exhibition units on the site was approved by Camden Council last October. A number of traders protested against the plan and said the six weeks' notice they were given to relocate to alternative sites was insufficient. Trader Phillip Jonez told BBC London: "They have offered us a place in what looks like a dungeon to me. "They have offered so many people the same place that they can't accommodate everybody else." Several traders said managers persuaded them not to sign a petition against the redevelopment, and bullied them into signing a petition supporting the plan. Trader Lisa Perry said: "We were to sign it and throw away the other petition that we had got other people to sign." She said she understood that if she signed the petition against the redevelopment, "you would be out". 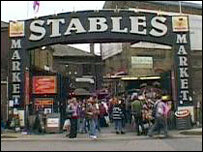 Stables Market (Camden) Ltd denied putting pressure on traders to support the plan. It said alternative trading sites had already been found for 45 of 60 traders affected by the redevelopment. "The rebuilding project has been known about by traders for over six years," a spokesman said. "All affected traders will be welcome to return to the new buildings once they are completed, and will benefit commercially from the market becoming an even more attractive destination for shoppers."